It was a coincidence that I was there. I just thought I should walk along the Rideau Canal for once. I never go walking there during my lunch break. I got lucky because I saw the parade on my way. I had no idea that there will be one and they would be walking towards me! I saw them on the Laurier bridge on this beautiful afternoon. Sun was rising and was warming us (due to the wind’s absence). I think fanfares are very emotional and they get you right there; you can’t ignore them and you can’t do like you don’t hear them. The drums resonate into your guts, the uniforms are splendid, the march is perfectly synchronized, the tone is noble. It’s very theatrical. Personally, I can’t disrespect this. Especially today. 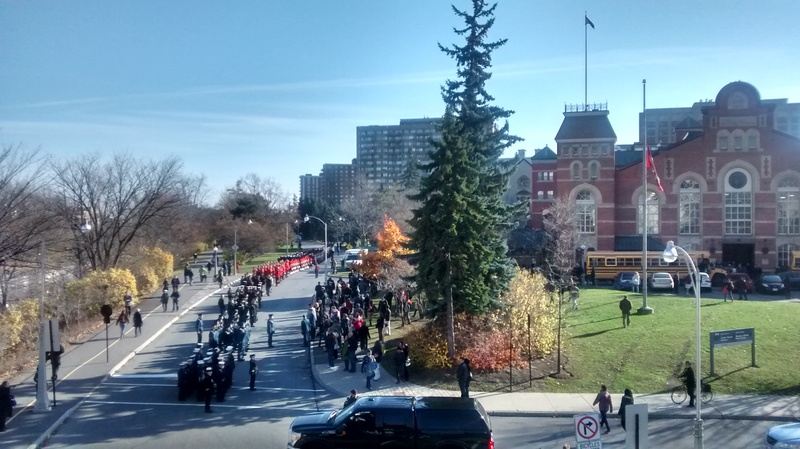 Remembrance day has been huge this year: thousands of people at the Memorial of War this morning attending the rededication of the memorial, many of them wore their poppy for the past few days or weeks and placed them on the Tomb of the Unknown Soldier, next to the Memorial, after the ceremonies. The poppy is the symbol of Remembrance that also helps raising funds for the veterans and those who suffer from the consequences of war (you can give how much you want while buying it). When it started, veterans manufactured them, often because they couldn’t do much else. The tradition here is you attach the plastic flower on your jacket with a pin on your left-hand side the closest to your heart, from the last Friday of October and take it off at the end of Remembrance Day. Listening to other Canadians and reading the press (and living the events on October 22nd in Ottawa as well! ), I have guessed that this day had a proportion it didn’t have the past years. The symbol couldn’t have had more impact: the attack on the soldier guarding the Memorial War and at the Parliament has hurt Canada right into its heart. I think it has awaken more deeply the conscience regarding the militaries and lots of people have been touched. Since this happened, I hesitate between two feelings. When I heard about the shooting, I took it like a piece of news, just a little bit more surprised as it happened close to our office. Then, we received the alerts via emails from our company ordering to turn off the lights, close the blinds and hide under our desks. Wow. Is this a earthquake or just some guy with a gun? I was both a bit scared with the gravity of the events and their results but I put it into perspective “Am I really really in danger? Would this guy walk in now? If he does, he sure is lost and isn’t gonna shoot us and ask some directions”. Is it my French side which directs me thinking this way that nothing is ever too serious? Is it a Canadian way of overreacting, like they sometimes do with enthusiasm? Anyhow, this is very interesting to really feel this whole patriotism from inside, next to citizens of Canada. In particular because I have the impression we aren’t much patriotic in France anymore. However, it reminded me of how we used to celebrate November 11th in my village, when I was little. Moreover, my mother told me last weekend “this year, I think we will do it like we used to, when you were little”. This is maybe why this memory came back: we go from one “monument aux morts” in one village to the other in another village (doing a few in our “canton”, which is smaller than a region and a “département” but no French Geography course right now :P). The mayor of the village reads the name written on the “monument aux morts”, for example “Jean-Francois Bourgois” and all villagers present would reply in a same voice “Mort pour la France”, literally “dead for France”. This was just annoying for me when I was pulled out of my bed on a bank holiday before 10.30 a.m. when I was little, but I remember it with emotion today. On the blog of my parents’ friend (he writes in French very interesting historical facts he searches for about my village and the area around) you can see the “monument aux morts” in my village.